Green People Oy! Cleanse & Moisturise is a Cleanser, Moisturiser & Make-up Remover - all in 1 bottle for young skin! Free from gunk! You won`t find any Parabens, phthalates or artificial fragrances in this natural cleanser..
Aqua, *Helianthus annuus seed oil, Salix nigra bark extract, *Cannabis sativa seed oil, Cetearyl glucoside, Cetearyl alcohol, *Rosa moschata seed oil, Alpha-glucan oligosaccharide, Glyceryl stearate, Levulinic acid, *Aloe barbadensis powder, Glycerin , Sodium stearoyl glutamate, ^*Butyrospermum parkii butter, *Rosmarinus officinalis extract, *Camelia sinensis extract, Aroma [*Cananga odorata (ylang ylang) oil, *Citrus nobilis peel oil, *Citrus aurantium dulcis peel oil], Melaleuca alternifolia leaf extract, Sclerotium gum, Xanthan gum, Sodium Lauryl Glucose Carboxylate, Lauryl glucoside, Potassium sorbate, Citric acid, *Benzyl salicylate, *Geraniol, *Benzyl benzoate, *Farnesol, *Linalool, Limonene. For day and night! Cleanse Rub over face and neck, wipe off with something clean. Moisturise Tap, tap, tap into face and neck. Below are reviews of Green People Oy! Cleanse & Moisturise - 50ml by bodykind customers. If you have tried this product we'd love to hear what you think so please leave a review. Green People Oy! 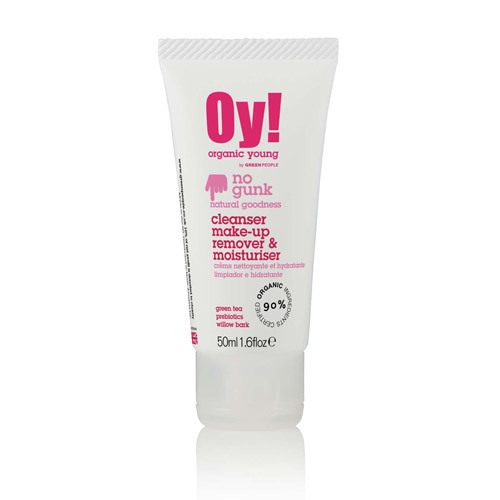 Cleanse & Moisturise is a Cleanser, Moisturiser & Make-up Remover - all in 1 bottle for young skin!.